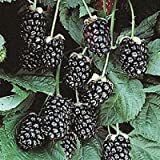 Blackberry bush for sale is available in leafy stem cutting and root cutting. It is best planted as early in the spring as possible. If you want to grow lots of blackberry bushes, leafy stem cuttings are probably the best way to go. When buying a Blackberry bush for sale, inspect and choose a variety that is free from viruses as this plant is prone to diseases. 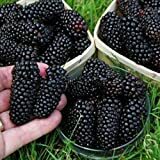 In planting blackberries, you need to make sure you do not plant the bushes where peppers, tomatoes, eggplants, potatoes or strawberries are growing, or have grown in the past three years or so. These plants are prone to certain bugs and problems that the growing blackberry plants are also prone to, so keep away from these areas. Location – Blackberries do best in areas with full sunshine but can also tolerate some shade. They won’t produce any fruit if you place them in too much shade. Also make sure to plant your blackberries far away from wild blackberries that may carry viruses. Soil – Avoid areas with heavy clay or sandy soil. Select a fertile soil with good drainage and aeration with pH between 5.5 and 7 for best results. You can add organic soil matter to improve the soil condition. Till through and free the soil from clumps and rocks that can obstruct the growing roots. 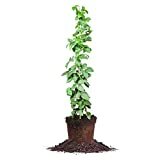 Planting – Plant shallowly about one inch deeper than they were grown. For semi-erect cultivars, space plants 5 to 6 feet apart. Space the erect cultivars 3 feet apart while trailing varieties are spaced 5 to 8 feet apart. Space rows about 8 feet apart. In addition, cut the plants back to about 6 inches after you plant them. Sometimes planting blackberries next to a trellis will help because the bush is a climbing type. Mulching – Keep a thick layer of mulch surrounding your blackberry plants at all times to help conserve moisture and suffocate weeds which can compete with the nutrients for your plant. Nourishment – Water you blackberry plant after planting. A year after planting, fertilize the ground in the spring as soon as you can and give your blackberry plants about an inch of water per week. Also make sure to water between rainy times. Do not overwater because it will cause root rot and eventually kill your plant. Pruning – Removing majority of the shoots that the roots produce will help to ensure that survivors produce lots a berries. Cut off broken and damaged stems as well and remove the weeds around your plant as necessary. Harvesting – Once you see ripened blackberries, you may pick them regularly every 3 to 6 days to prevent birds from getting the fruits. Unlike raspberries, you pick blackberries by keeping the central plug within the fruit. You can consume them fresh or for bumper crops, store by canning, preserving or freezing. If you have taken good care of your blackberry, you can enjoy harvesting fruits for 10 or more years.